Muhammad Naeem has 20 plus years diversified experience in Quality Operations, Regulatory Affairs, Research & Development and Operational Excellence. He is RAC-Global certified from RAPS as well as an active member of RAPS-USA, ISPE & PDA. He has an extensive working knowledge of FDA, EMEA, WHO, ICH, USP, BP, and other global regulations for Pharmaceuticals. He has lead several Investigational/Developmental and Technical/Analytical Projects at CMOs in USA, Europe and Pakistan. Some of the major pharmaceuticals he served are Pfizer & Takeda (USA), CCL Pharmaceuticals and Indus Pharma (Pakistan). He has strong scientific, analytical, planning, managerial and training skills. He has attended many national and international conferences as a speaker on multiple topics like Quality Risk Management, Data integrity, Pharmacovigilance, QMS elements, Validation, cGMP Guidelines, etc. 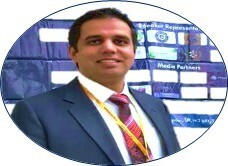 Currently, he is serving as Chief Operating Officer (Technical) at Indus Pharma.